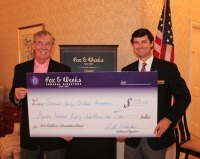 Fox & Weeks Funeral Directors was honored to award a York Children’s Foundation grant in the amount of $750 to the Savannah Early Childhood Foundation. The Savannah Early Childhood Foundation is a groundbreaking organization founded in 2011 that pools community resources to ensure that all Savannah children are ready for school. Combining public and private resources, Savannah Early Childhood Foundation is focused on helping parents create high quality learning environments for their children starting at birth through age five through multi-session Early Learning College programs for parents in several neighborhoods throughout the city. The purpose of the York Children’s Foundation is to award grants to non-profit organizations dedicated to supporting children, and any organization in the Coastal Empire with the primary purpose of providing for children’s needs is eligible to apply for a York Children’s Foundation grant. Fox & Weeks is the only funeral home in the area actively participating in the York Children’s Foundation program and has now distributed more than $10,000 to local non-profits serving children’s needs since 2012.